In the current market, many blockchain startups have started to focus heavily on building the technological infrastructure that will enable blockchain to thrive in the long term. Blockchain protocols create an irrefutable system of agreement between various devices across a distributed network, with many protocols developing innovative scaling solutions to handle large transaction volumes. However, there are still immense challenges with enhancing blockchain scalability. What are these challenges and how can we approach these issues in the near future? Switzerland-based Liquidity Network is an off-chain payment ecosystem offering zero fees and instant transfers. It supports the exchange of digital assets, scales like a bank but doesn’t hold funds. 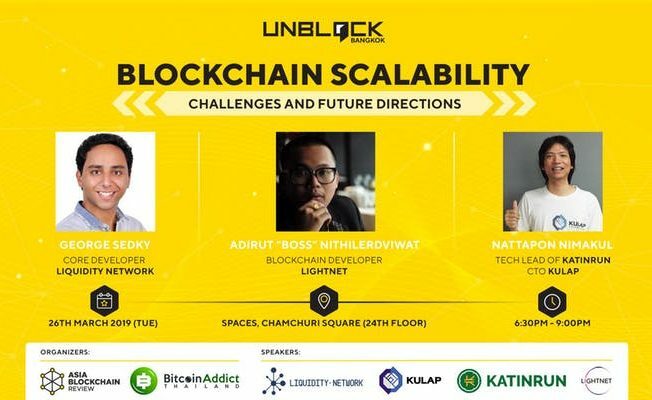 Lightnet is one of the largest revolutionized financial services network in Southeast Asia, backed by K Chatchaval Jiaravanon (CP Group Family member, Founder of AEON, Finansia Syrus etc) and “Stellar”, the World’s top Blockchain network. Lightnet was created from the vision that everyone should be able to access financial services anytime and from anywhere. Kulap is the decentralized best rate protocol. This protocol gets real-time digital asset exchange rate from a worldwide marketplace, using an algorithm to find the “best price” for users automatically. Katinrun is developing an Ethereum-based donation platform where a donee who needs some support and a donor who wants to give support can meet together. For Unblock Bangkok Telegram Group, please join here.